For many (most?) 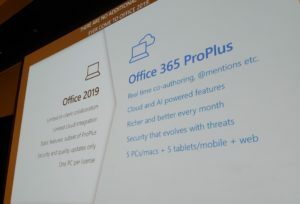 corporate users, Office 2019 would be a step down from what the Office 365 Pro Plus they are using now. Office 2019 is a non-subscription based version of Office 365 ProPlus from October 2018 (yes, that is next month). If you have Office 365 Pro Plus, you already have Office 2019. Microsoft emphatically claims that Office 2019 is the very last version of MS Office that consumers or companies will be able to buy as a standalone product. From now on, there will be Office 365 Pro Plus and nothing else. One Microsoft presenter at the 2018 Ignite conference said that “Microsoft has taken out the upgrade” and went on to explain that subscription based Office 365 ProPlus updates constantly so there is no “it’s been 3 years so hear is a whole new version”. Office 2019 licenses are locked to a single PC. They are tied to the hardware like old school OEM product. Compare this to Office 365 ProPlus which provides 5 concurrent use licenses tied to the user, not the hardware. This becomes quite problematic for content creation companies since sharing the necessary writing tools is not only increasingly difficult but also ends up costing more. Those involved in this particular niche such as bloggers, journalists, creative content creators or academic paper writing experts will prefer the Office 365 Pro Plus over the 2019 version for all their writing needs. Office 2019 provides customers with a perpetual license that can be activated directly from Microsoft over the internet (as many consumers are used to), through your company’s Key Management Server (KMS) or using a Multi Activation Key (MAK). MAK’s are still provided directly from Microsoft to companies that need to activate Office on PC’s that cannot connect to the internet or may not connect to the internet for 6 months or more (which is the maximum interval a KMS can live without being revalidated). Microsoft will only provide security and reliability patches for Office 2019. It will have no new features added to it, ever. Compare this to Office 365 ProPlus that has major and minor new features added to it on a weekly basis. Office 2019 can only be installed on the C:\ drive and will no longer have an .MSI (Microsoft Installer) install option; it will be a Click-to-Run (C2R) install only. Click-to-Run does not share files like .DLL’s and is easier to update. As a result of this change to C2R, .MSI versions of Office should be uninstalled prior to the installation of Office 2019. Fortunately for companies the Office Deployment Tool can be set to uninstall previous Office installations just before it installs the new C2R Office 2019. Microsoft has been using C2R for 5+ years on billions of installs, so it is a proven technology for many of their products. ALL Click-to-Run updates are cumulative so you will not need to install an old patch before installing the latest update. SOLVED: What is Server Class Memory & What Else is New In Server 2019?